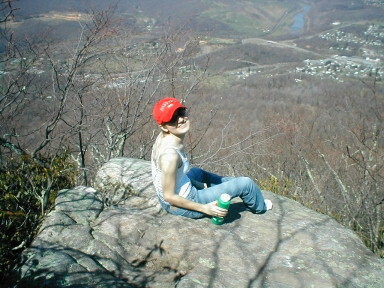 • Lee enjoys a relatively tree-free view of Pearisburg from atop Angel's Rest. As opposed to other hikes such as McAfee's knob, Angel's Rest is only comprised of one fairly small rock. • Gotta love those self-portraits. • Be forewarned: The angel's rest trail is not the easiest hike in the world. Although it provides excellent views of Pearisburg, it is a relatively steep hike and you may want to bring an extra bottle of water. Leave Blacksburg, VA @ 1:30 am to Pearisburg, VA. 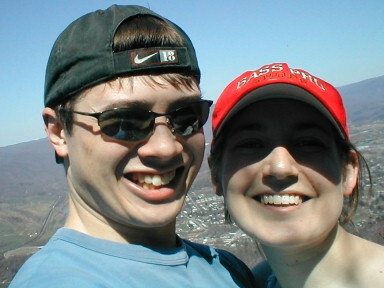 Arrive at Appalachian Trail crossing in Pearisburg at 2:15 pm, park car, and begin to hike up Angel's Rest Trail. Arrive at top of Angel's Rest after an hour and 15 minutes of hiking. After a half and hour of playtime, it's time to go back down the mountain. Arrive back at the bottom at 4:45 pm. Gotta stop by Dairy Queen and replenish the body with all that fat and cholesterol that leaked out while hiking up the trail. Back in Blacksburg by 6:00 pm and in plenty of time to finish homework due Monday. Follow Route 460 West from Blacksburg about 25 miles. Take the second Pearisburg exit from 460 West. Turn Right off the exit ramp onto Main Street. After about 500 feet, turn Right onto Johnston Avenue. 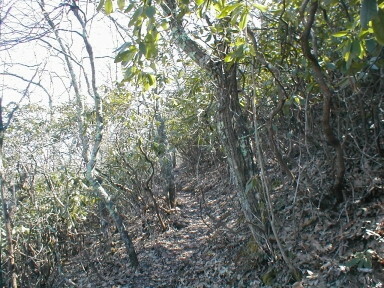 After about 500 feet, merge Right onto Morris Avenue and drive about 1 mile to the Appalachian Trail crossing. Park on the Left side of the road just after passing the AT; it will be next to a small creek and before a house.